You will fall in love with this Windsor Noble. Not only does this beautiful tree have soft, forward-curving needles, but it also features the Brilliant Lighting System. Finger shaped light strands unobtrusively extend a light to almost every tip, giving you a brilliantly lit tree without any unseemly wires. Shaping this tree right out of the box is made easy with each layer tied separately.Neuman Tree's Soft Multi light palette gives you 50% clear lights and 50% multi-color lights for a beautifully lit, festive look! *Windsor Noble (Soft Multi) 7.5 Feet pictured. 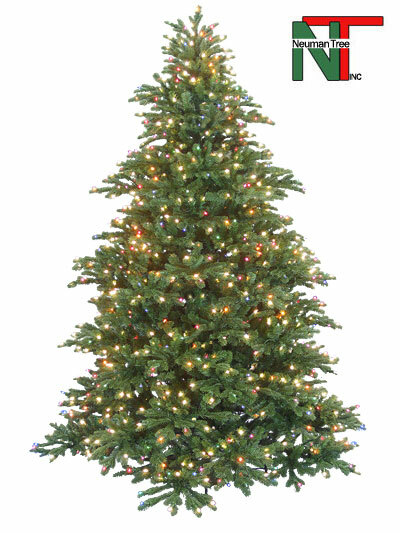 100 replacement lights are included with each tree, as well as two tree stands (for shaping, or converting your tree to a smaller size).